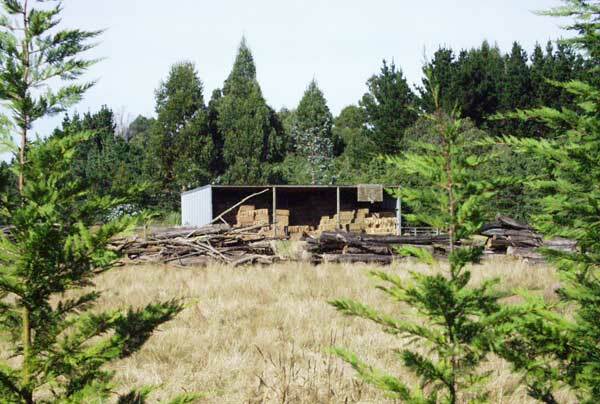 The hay-barn in the Hazelnut Orchard paddock has an eclectic collection of Moosey junk, neighbour's junk, plus bales of hay - just in case the sheep need feeding out. There are also a few rabbits and mice who make the hay-barn their home. The Moosey cats are so well fed that they don't bother coming here to hunt. Pity! Here is an early view from the car bridge down to the hay-barn and beyond to the lucerne paddock, before the hazel trees were planted. 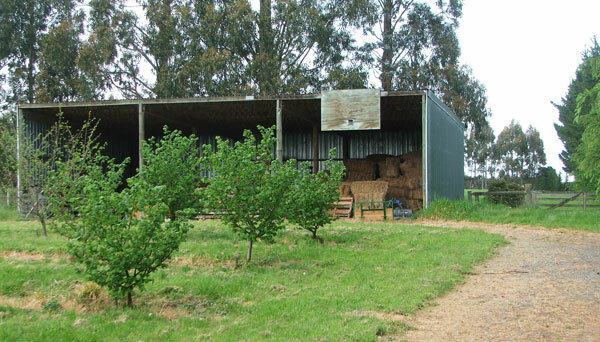 The basketball hoop hanging on the top right of the barn has produced a Canterbury rep basketball player. At the left the new row of shelter trees begins. These will give shelter from the southerly storms which are a feature of New Zealand's weather. They are Leyland Cypress.